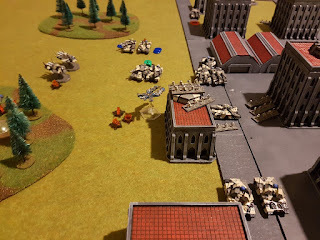 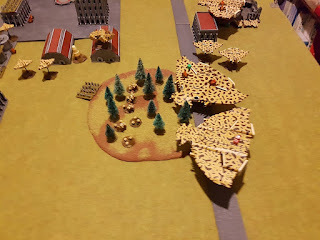 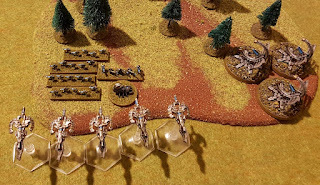 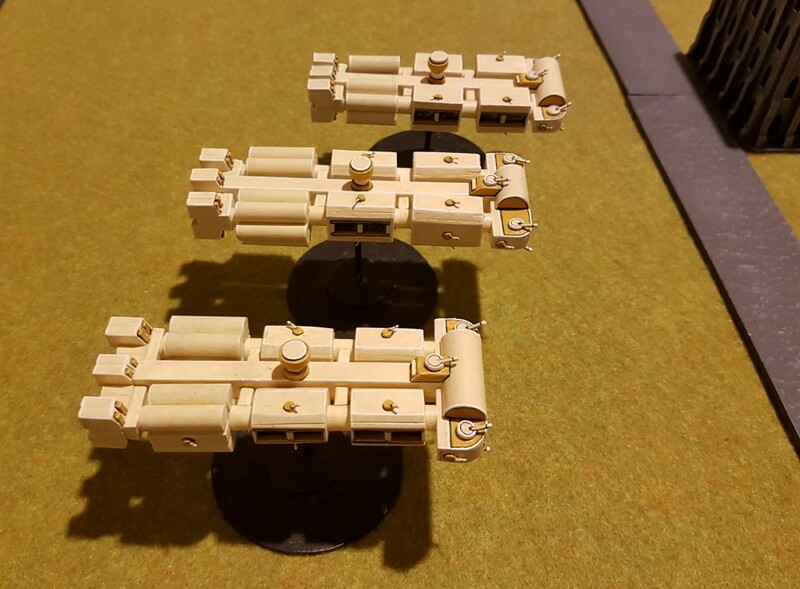 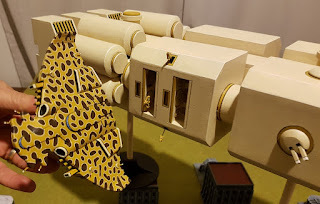 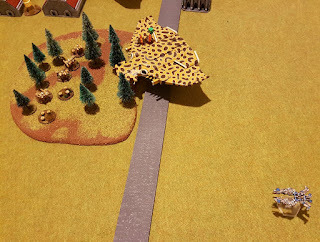 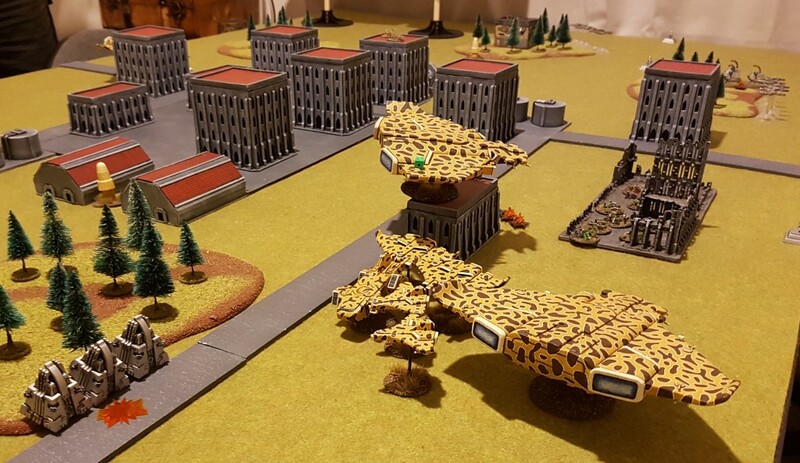 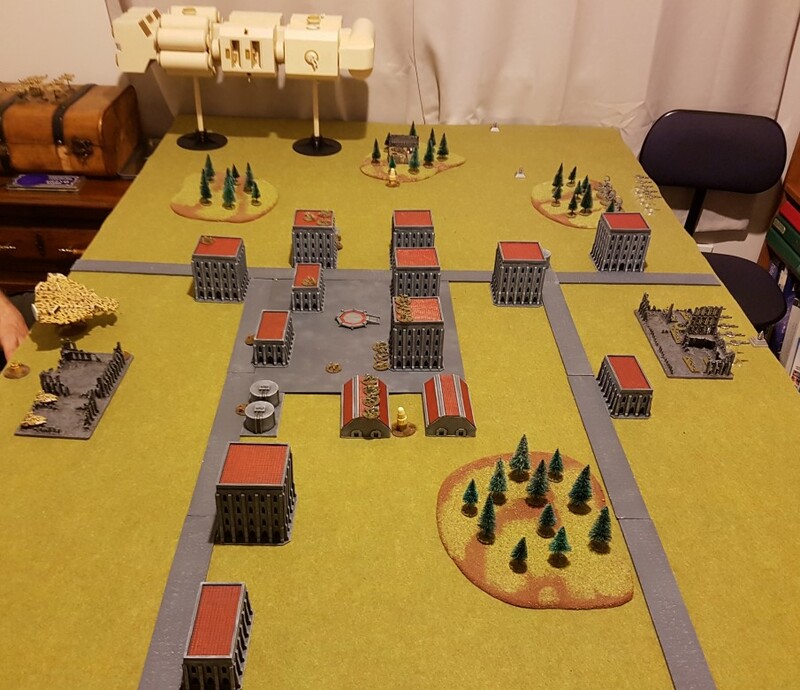 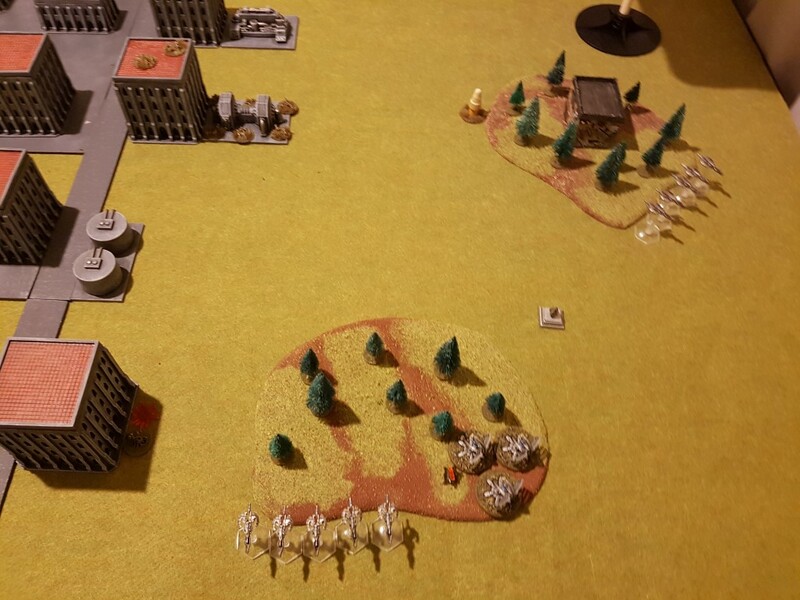 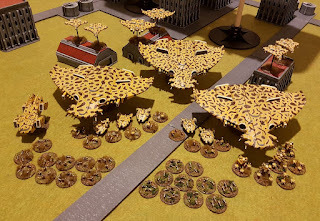 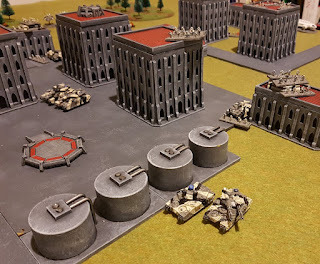 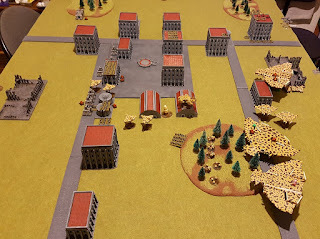 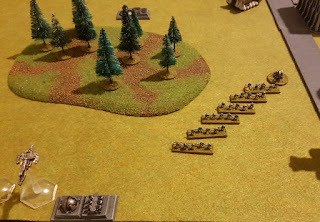 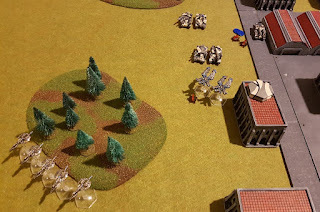 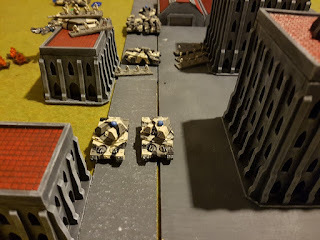 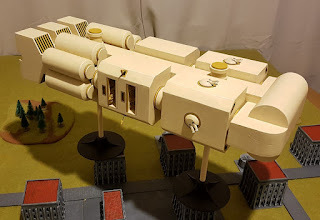 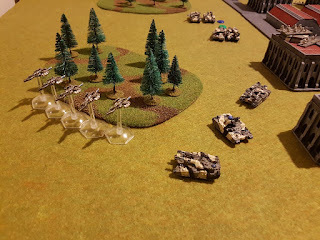 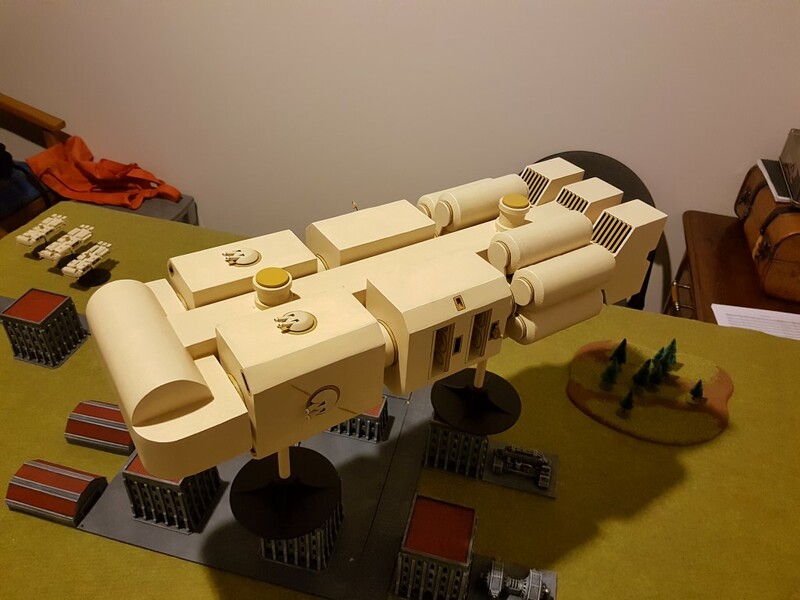 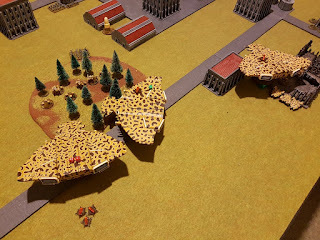 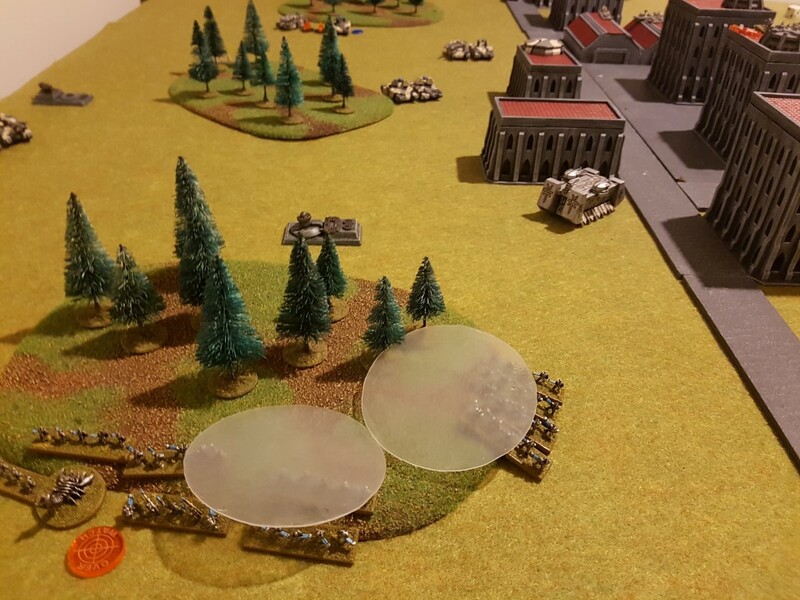 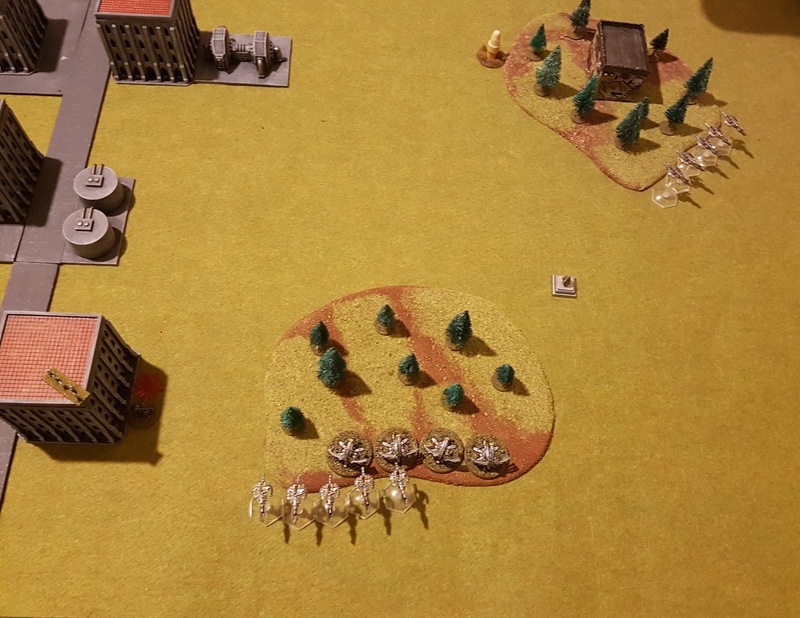 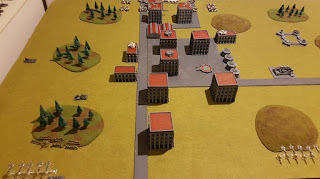 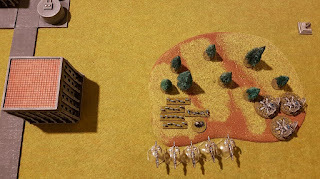 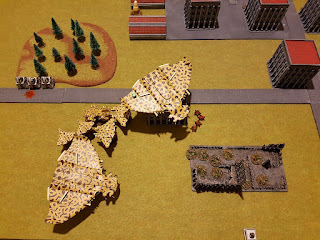 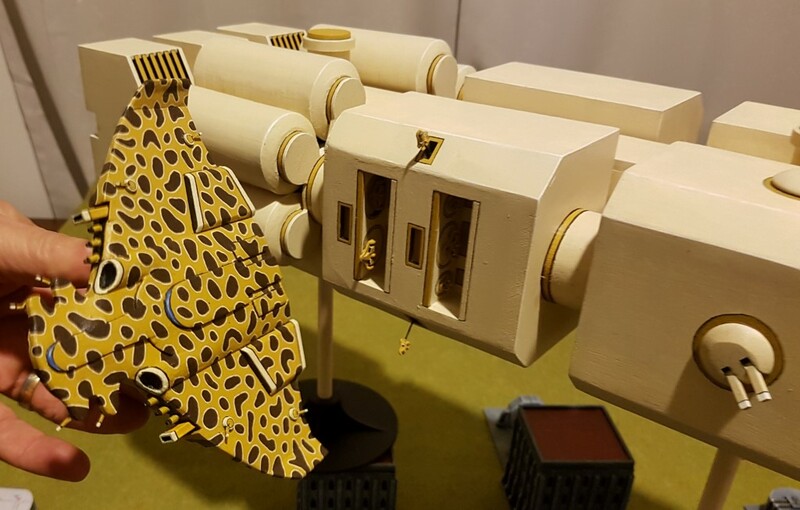 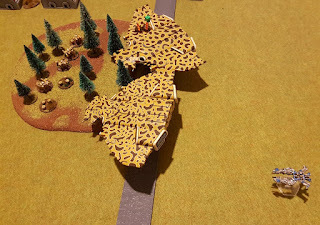 A late battle report, been busy with other things and didn't get around to it until now! 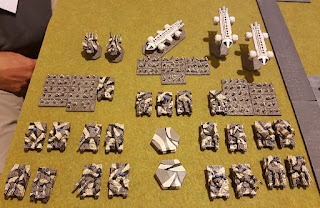 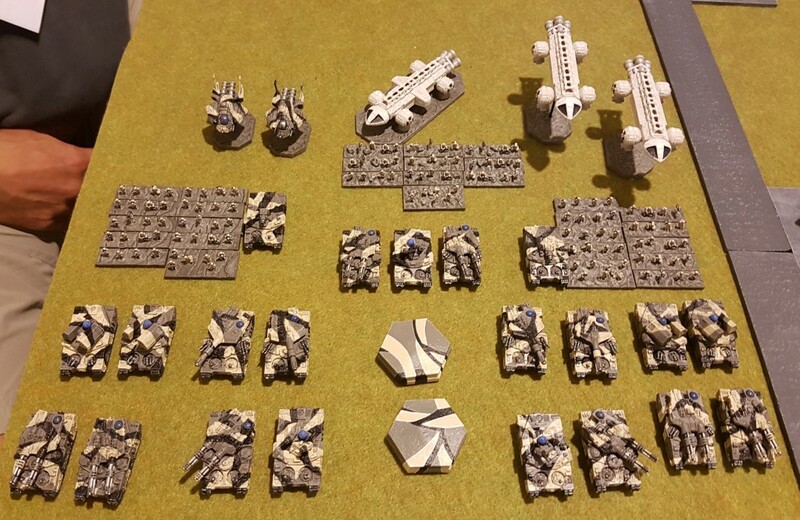 Played this a few weeks back so memory is a bit hazy, my Necrons against a Skitarii list. Here's the setup, most of my Necrons off table as is expected, bar my Commander and two Doom Ark formations. 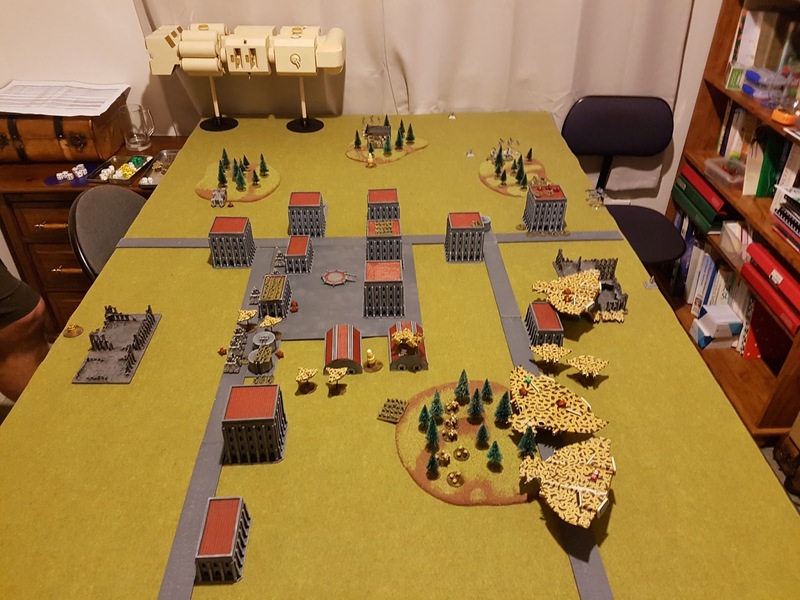 Here's the left side of table. 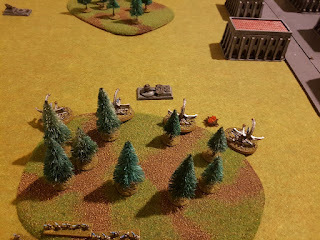 And right side of table. 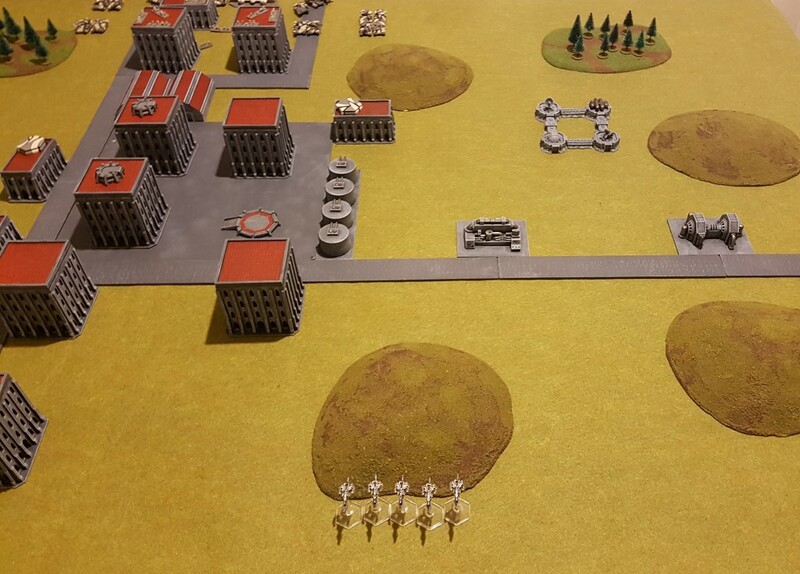 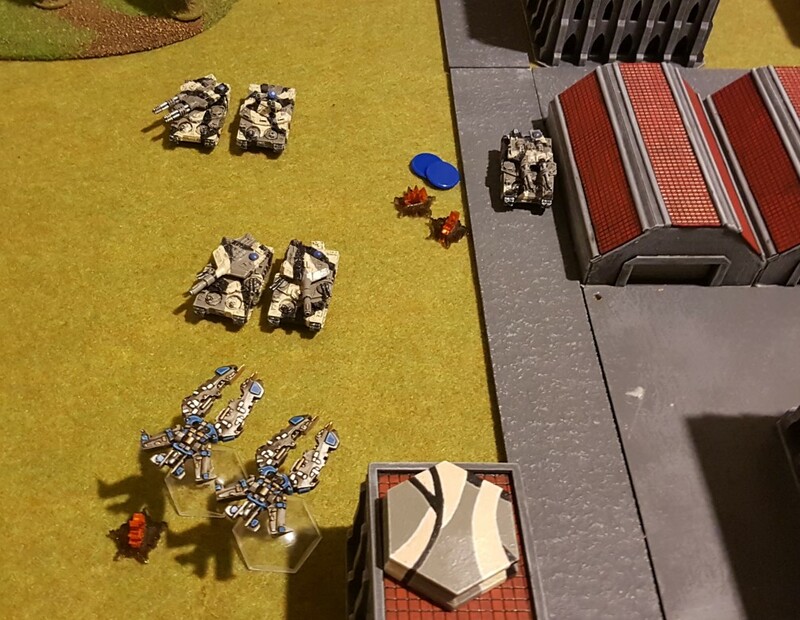 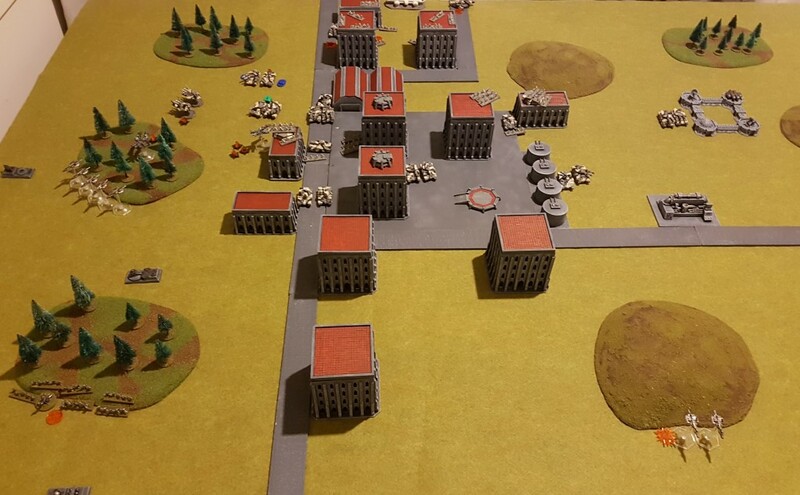 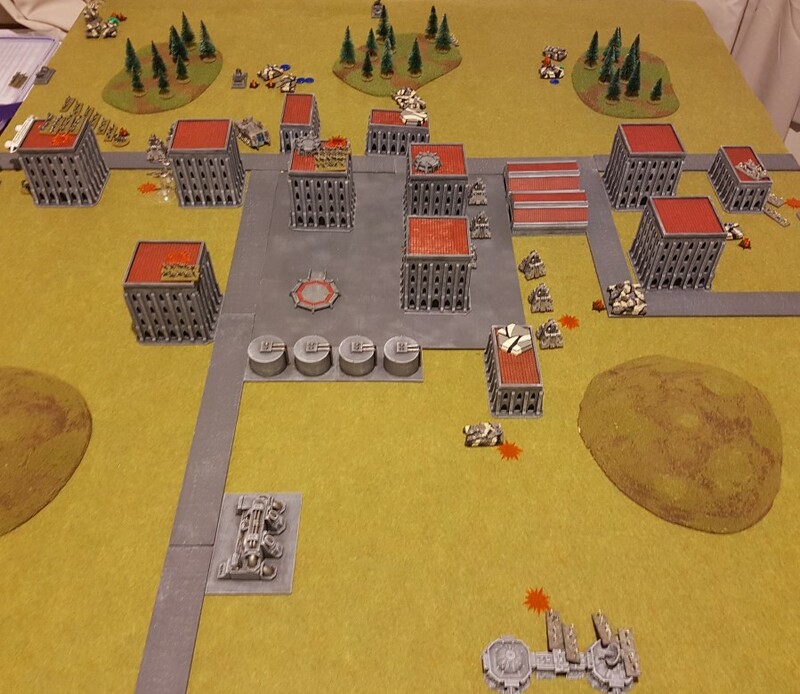 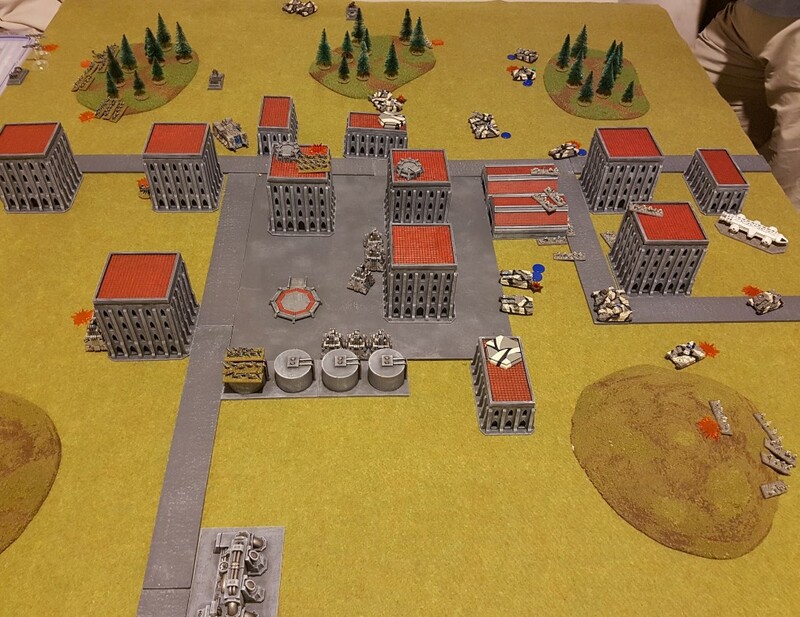 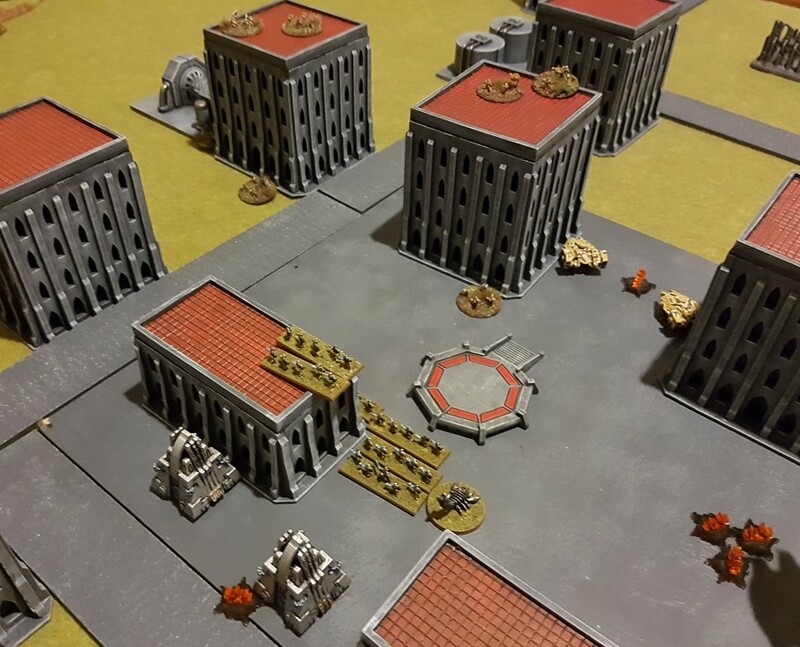 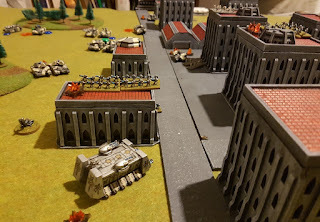 Skitarii deployed in mutually supporting formations approaching the city. 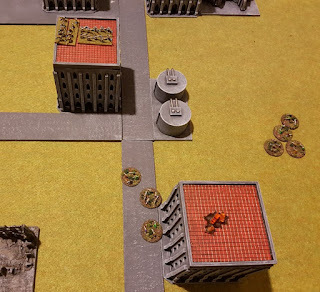 I teleport in my Pylons near my Blitz. 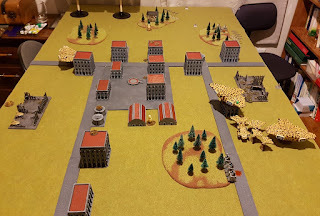 And commence some attacks on the advancing Skitarii Ordinatus. One is destroyed. The Skitarii push into the central city area in force, with both infantry and their Ordinatus. 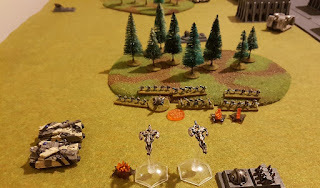 I loose a couple of aircraft and may have been too eager to brave the AA early on in this game. 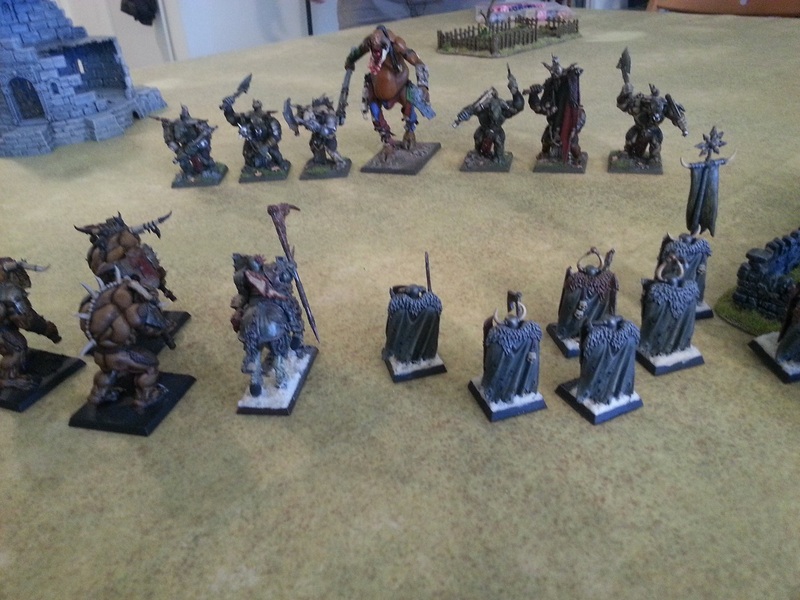 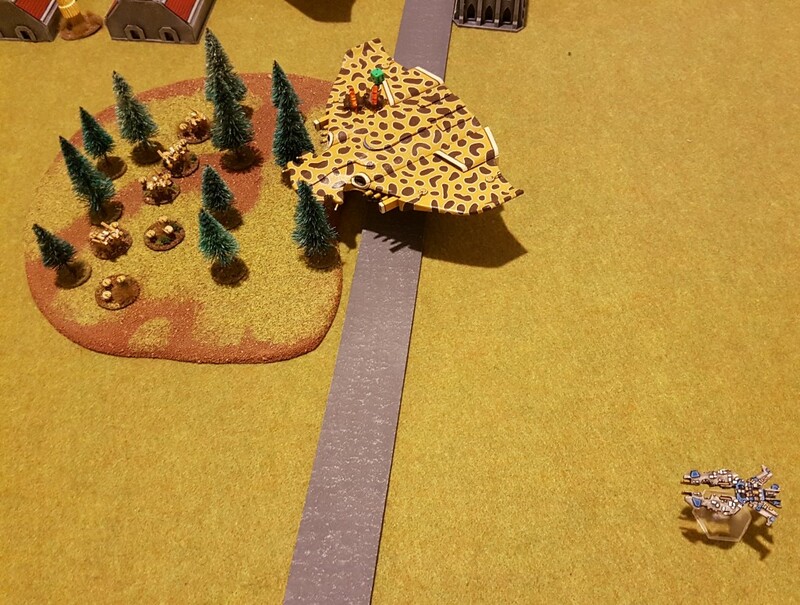 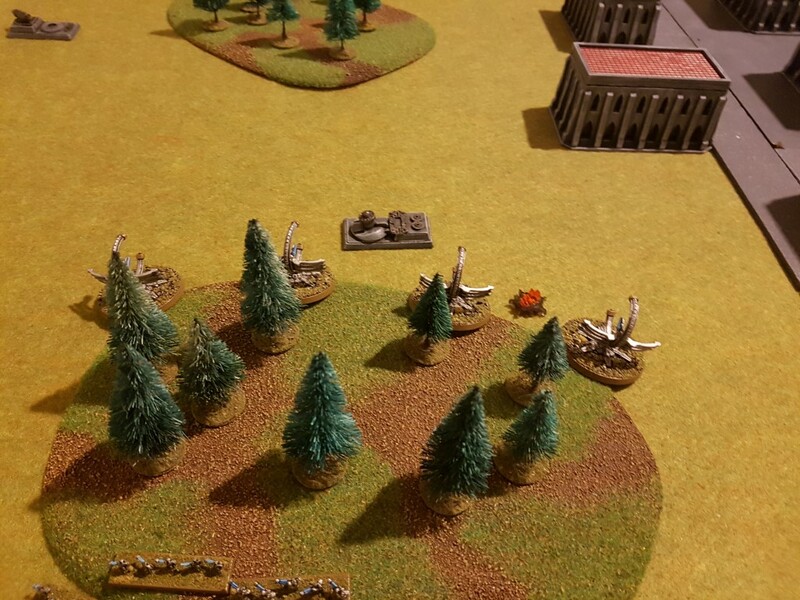 My Doom Arks on my right also advance and lose three of their number, falling back behind a hill. 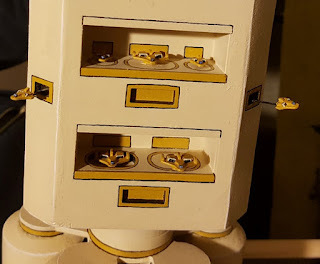 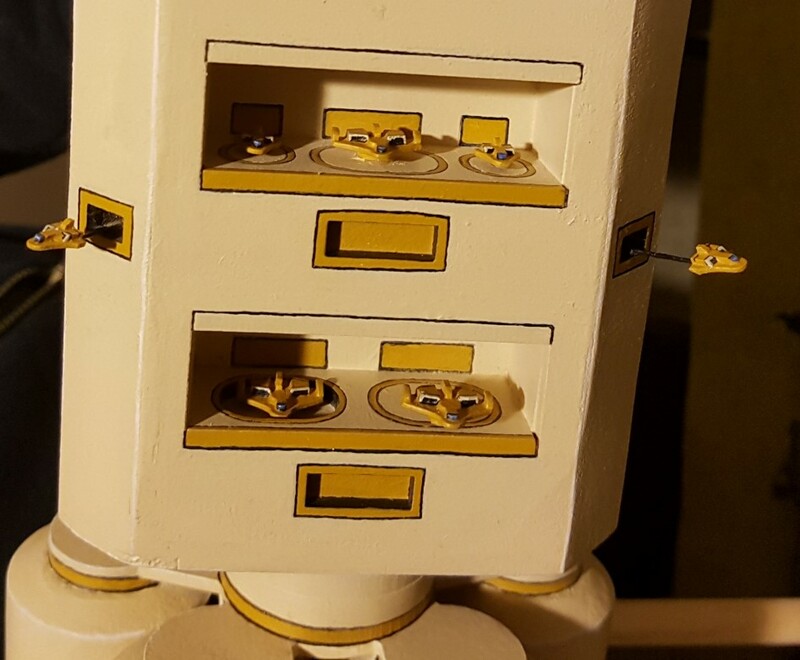 A look at some of the Skitarii in the city. 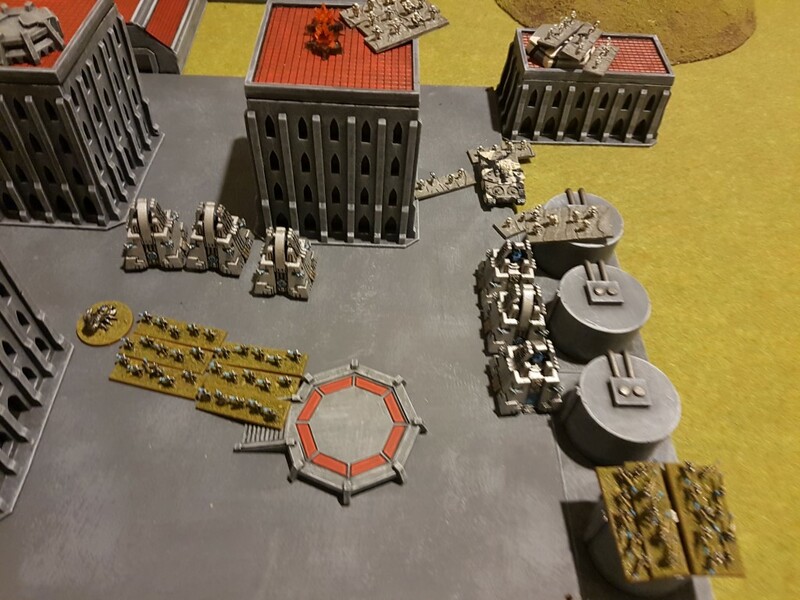 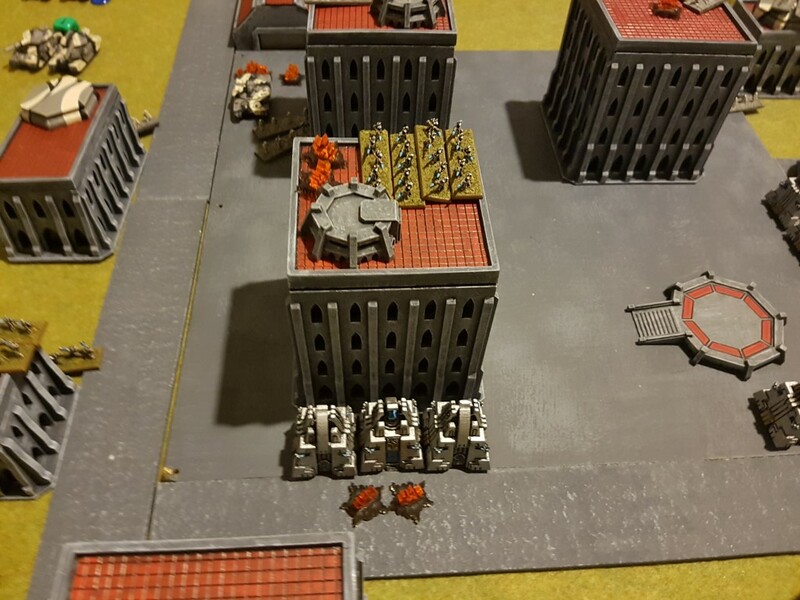 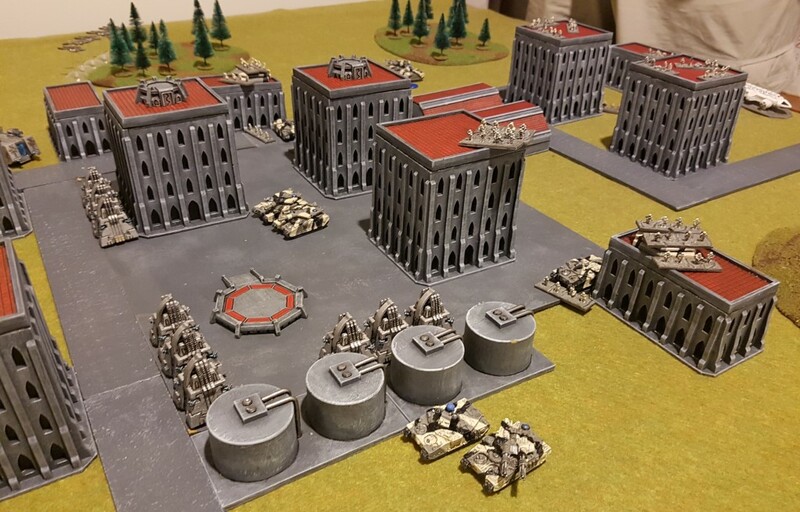 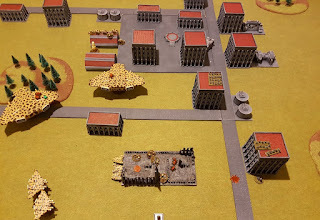 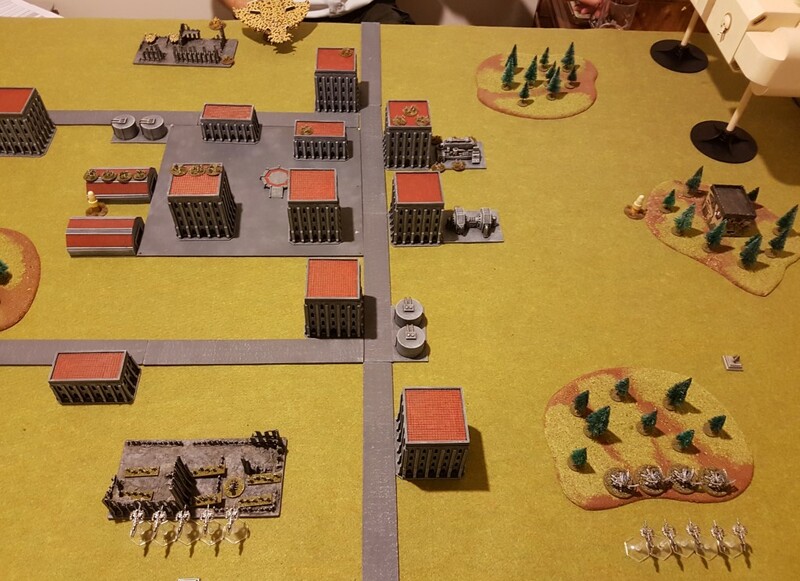 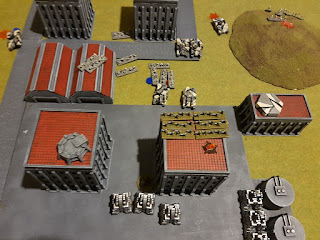 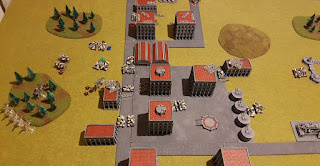 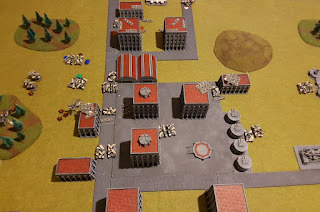 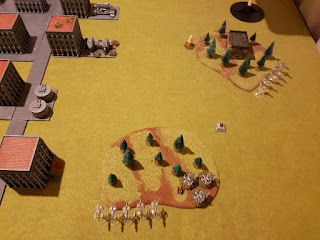 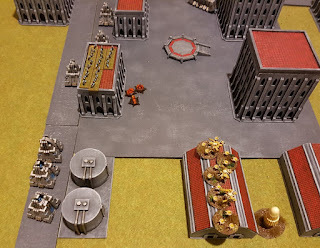 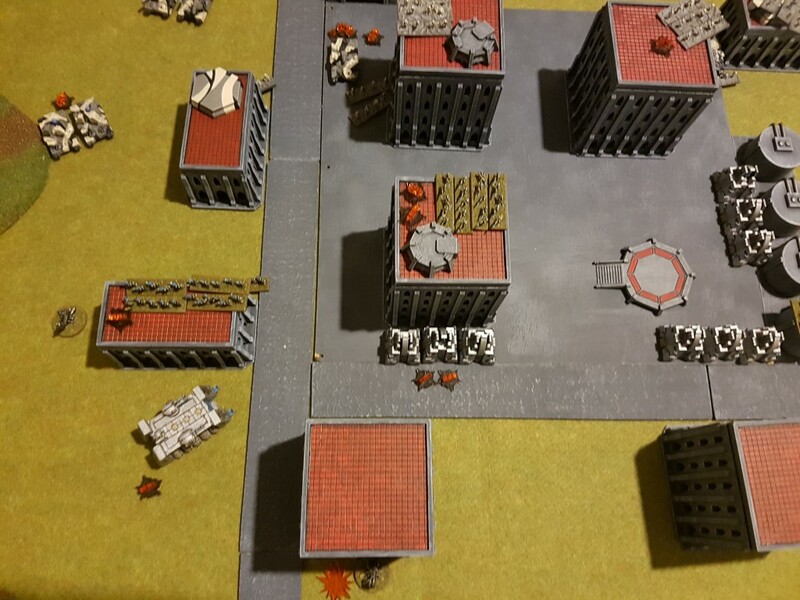 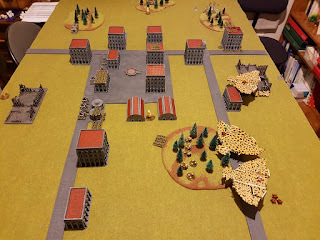 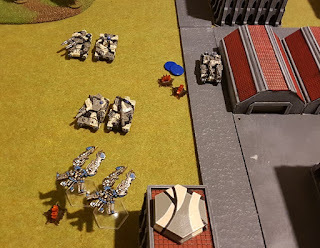 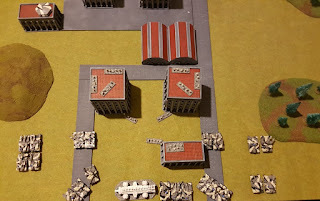 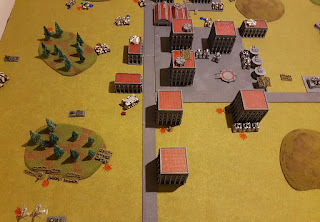 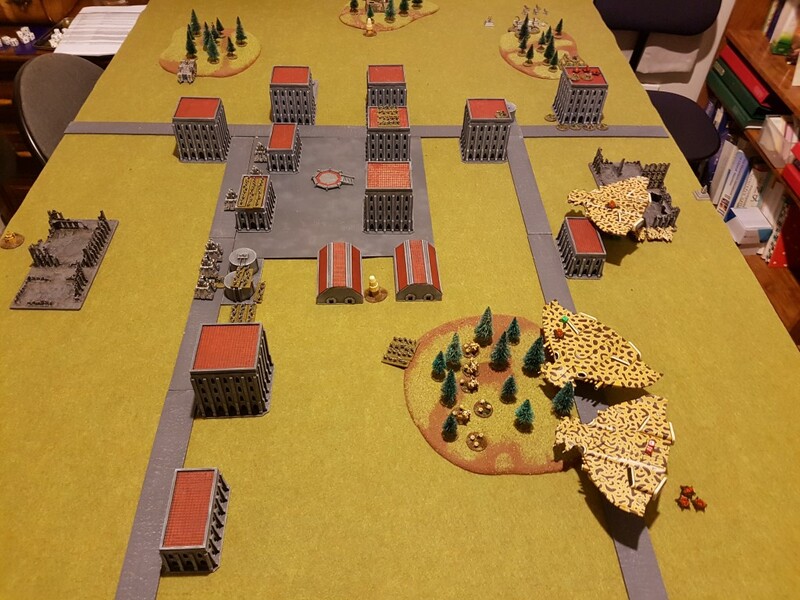 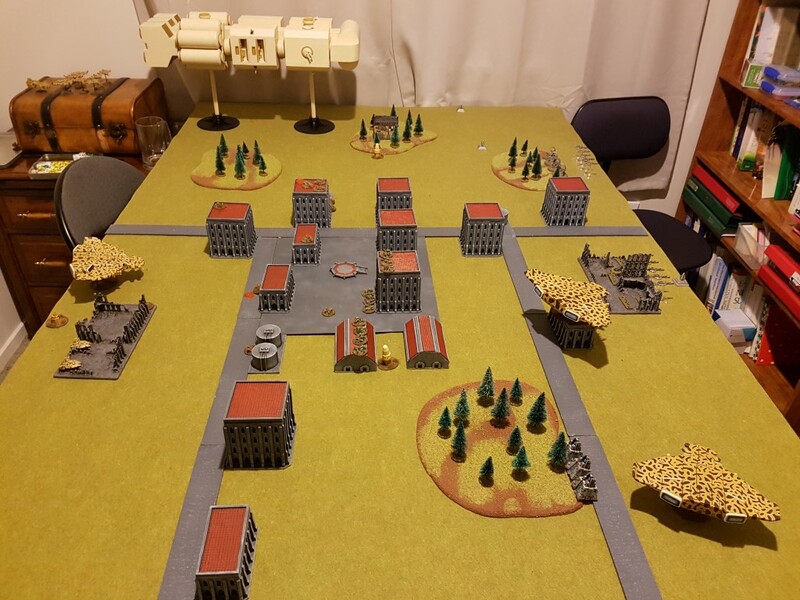 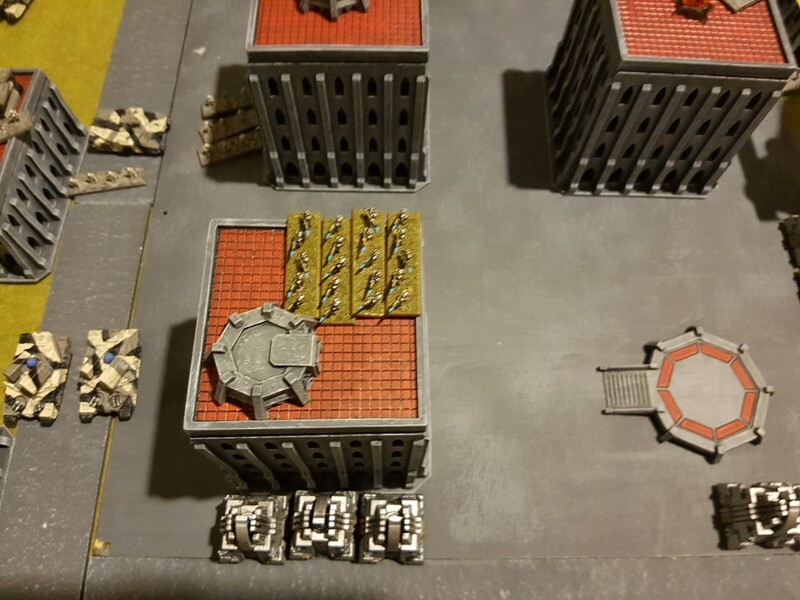 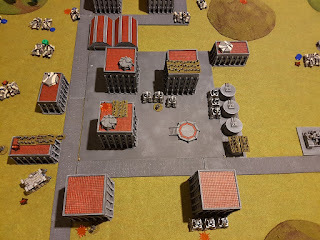 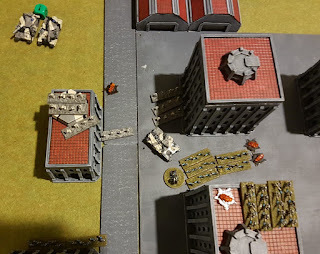 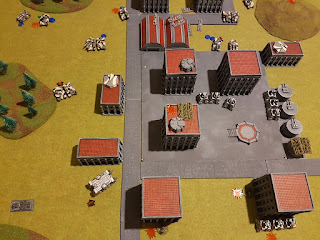 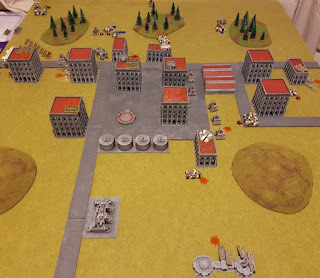 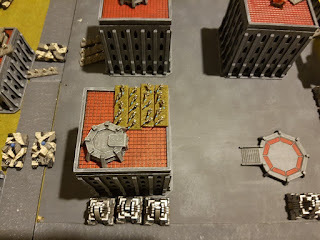 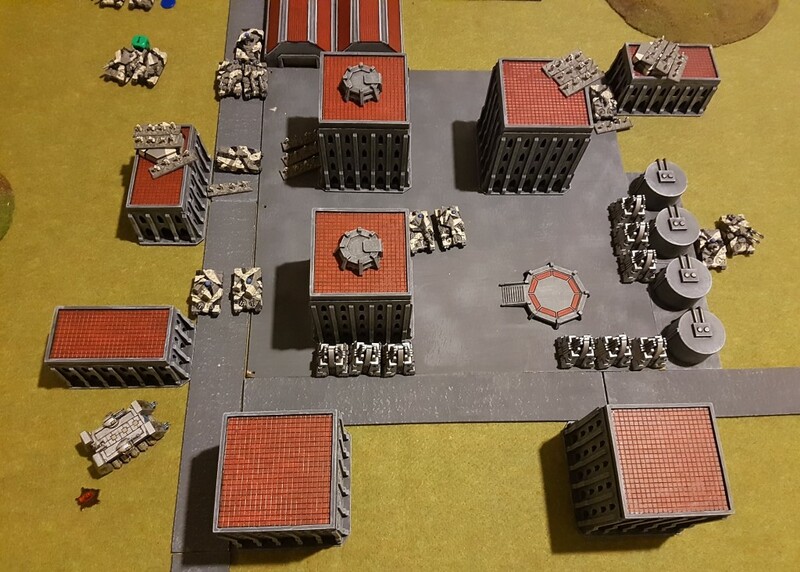 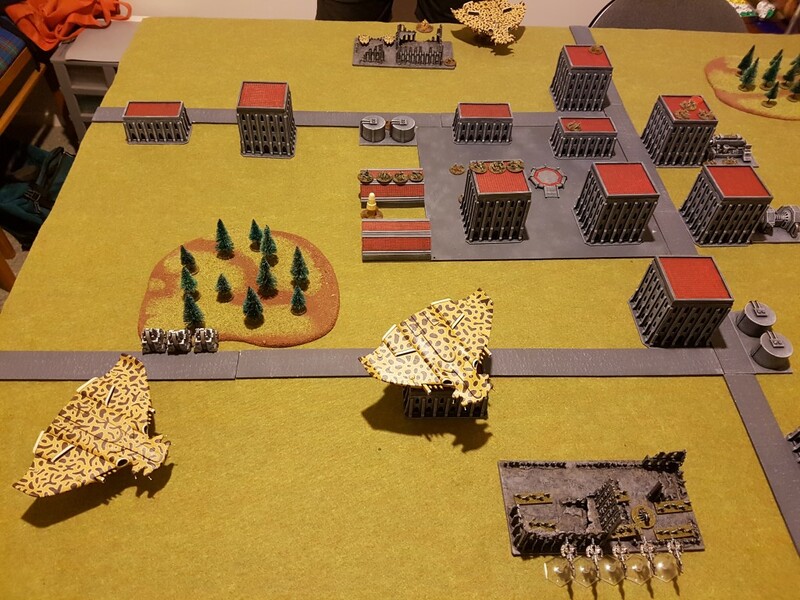 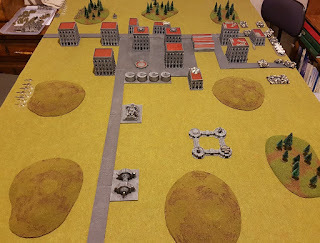 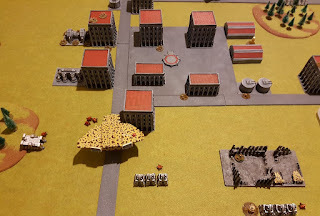 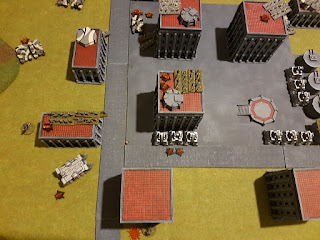 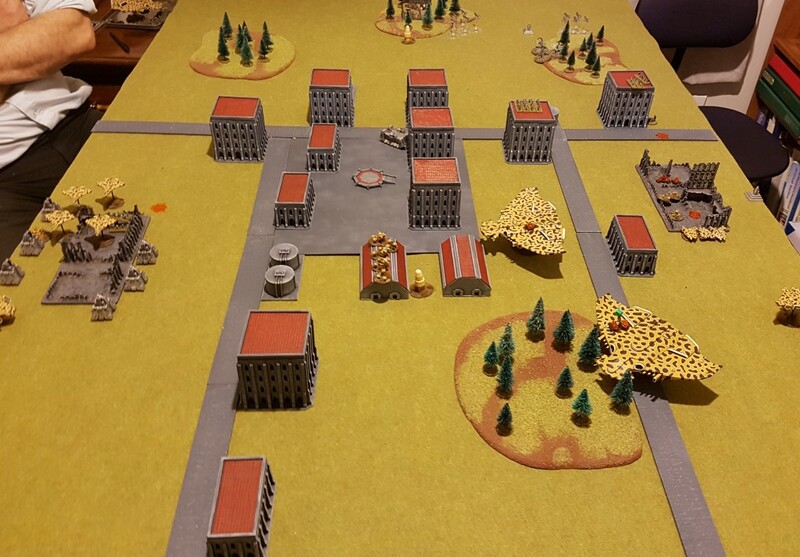 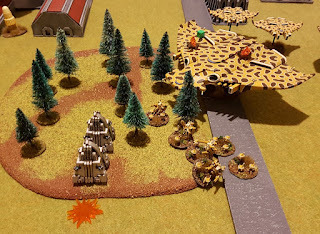 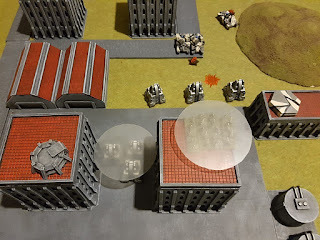 My plan for this game was to lure the Skitarii into the city area, and then jump on them with all my Necrons phasing in. So all the Necrons do just that this turn! 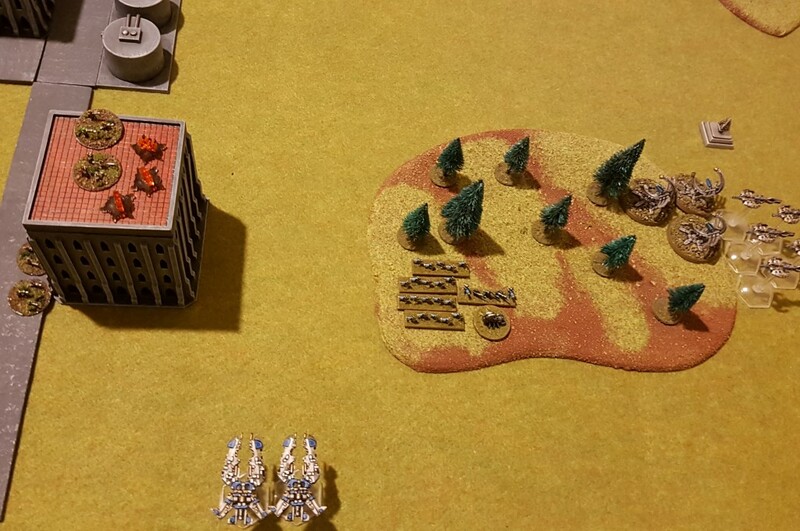 Skitarii win strategy roll and attempt to neutralise my left side Doom Arks. This they do and the survivors fall back to my blitz. 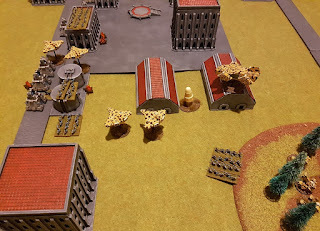 My Triarch Praetorians then destroy an Ordinatus, breaking the formation. 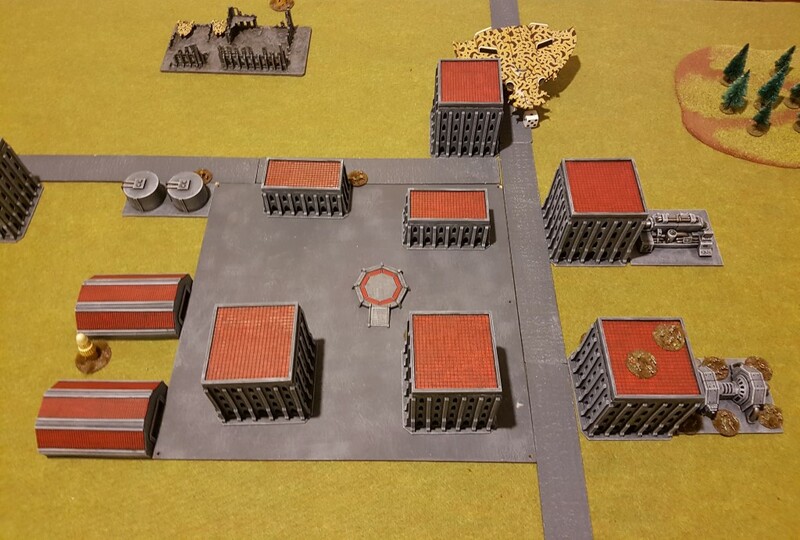 And then more Praetorians advance and break the Ordinatus formation in the centre of the city, consolidating into the building nearby. 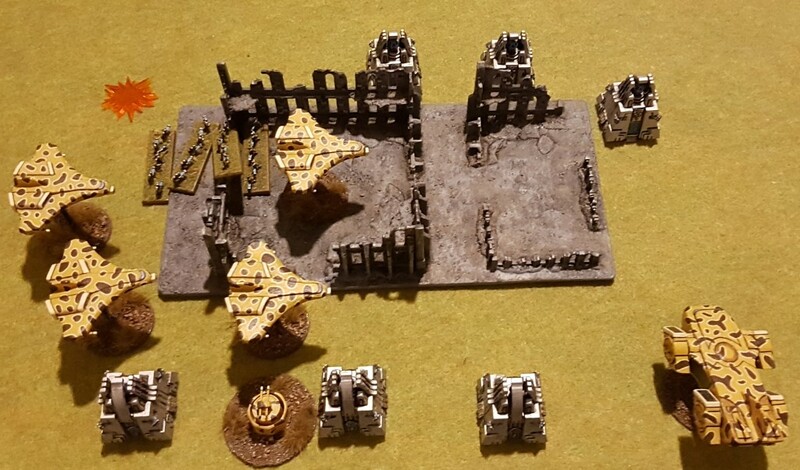 Skitarii reply with shooting but fail to do do much, before another Necron formation assaults from the War Barque breaking the third Ordinatus formation this turn. 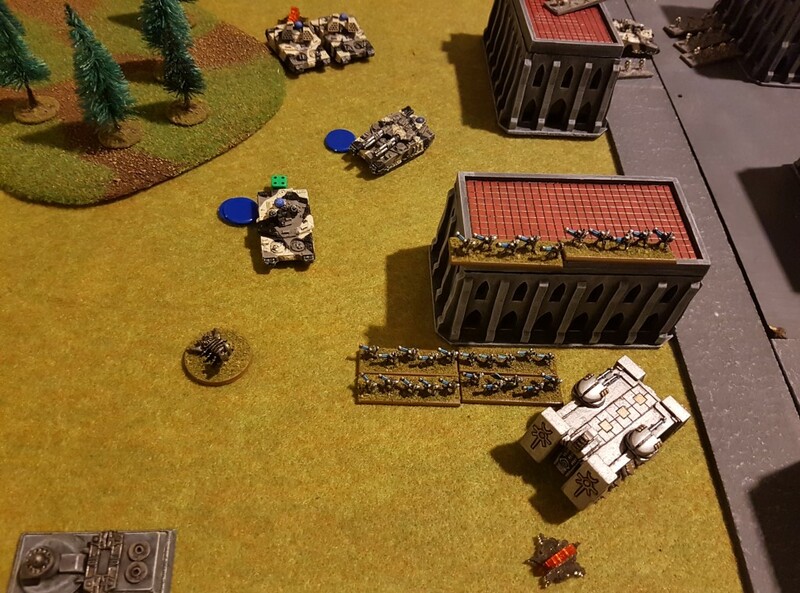 And yet more Necrons knock back a Skitarii infantry formation causing heavy casualties. 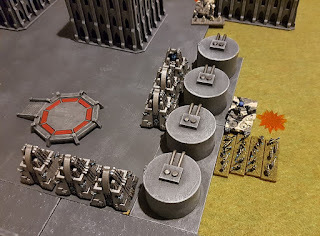 Return fire causes heavy casualties on the Necrons though, with only a Tomb Spyder surviving to fall back from one foramtion. Yet more Necrons force the assault onwards in the centre, throwing back another Skitarii infantry regiment. 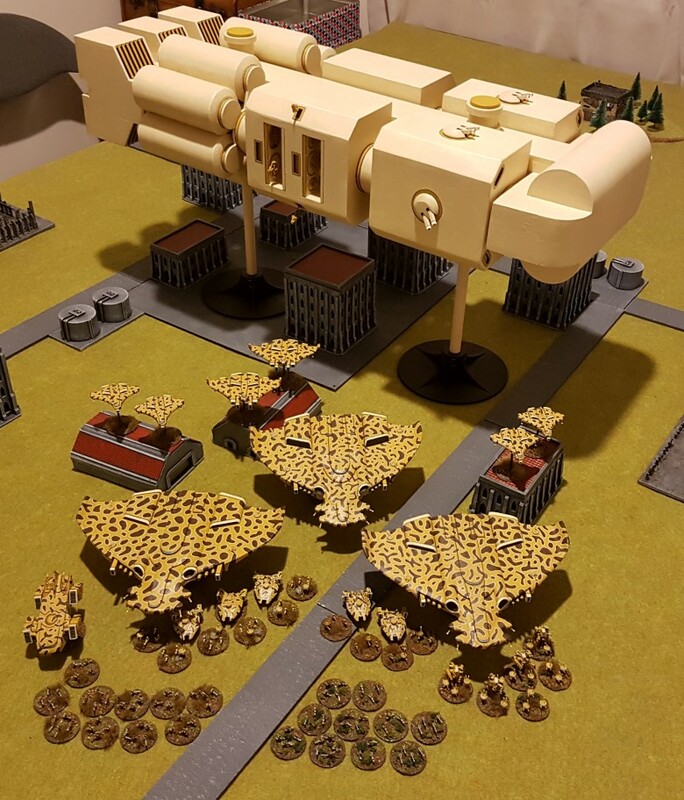 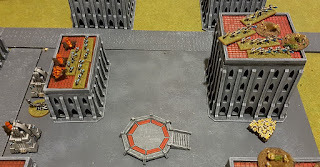 The city is in Necron hands/talons again. But the Skitarii launch a counter assault forcing the Necrons back with heavy casualties. And Ordinatus continue to advance on the flanks. 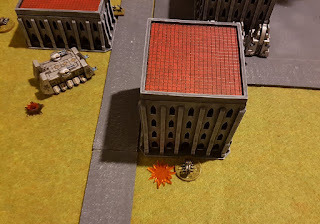 The Skitarii launch ordinance causing further casualties on the Necrons and softening up the Blitz defenders. Ordinatus drive within range of the Blitz and break the defending formation too. 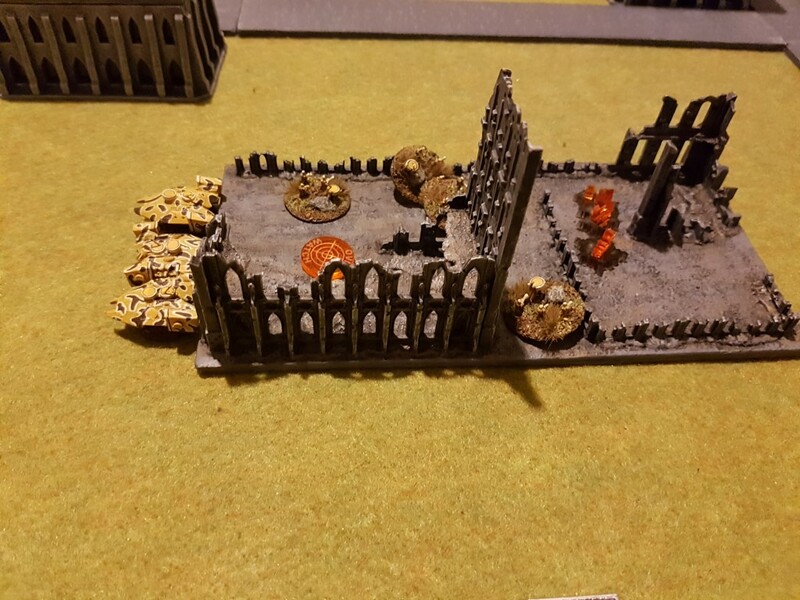 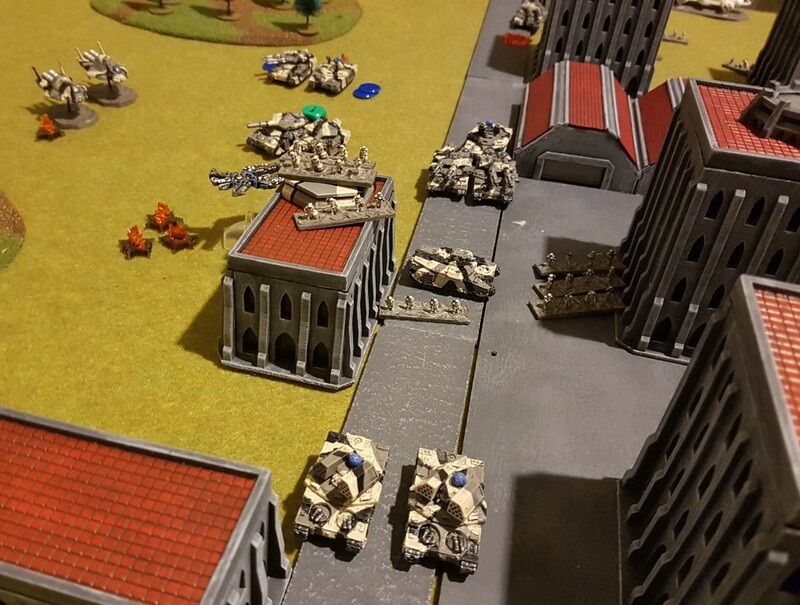 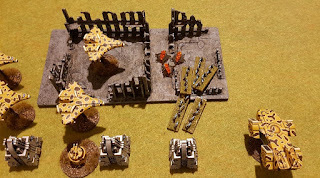 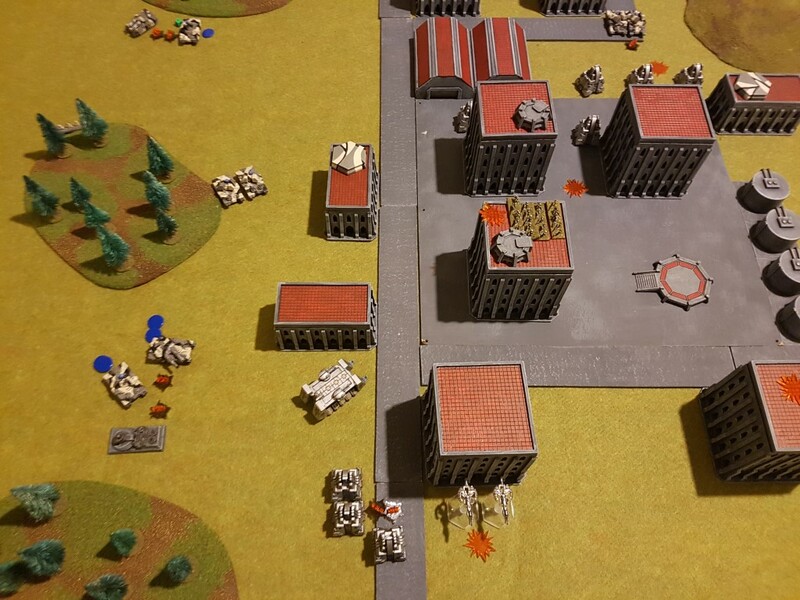 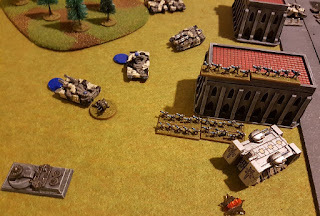 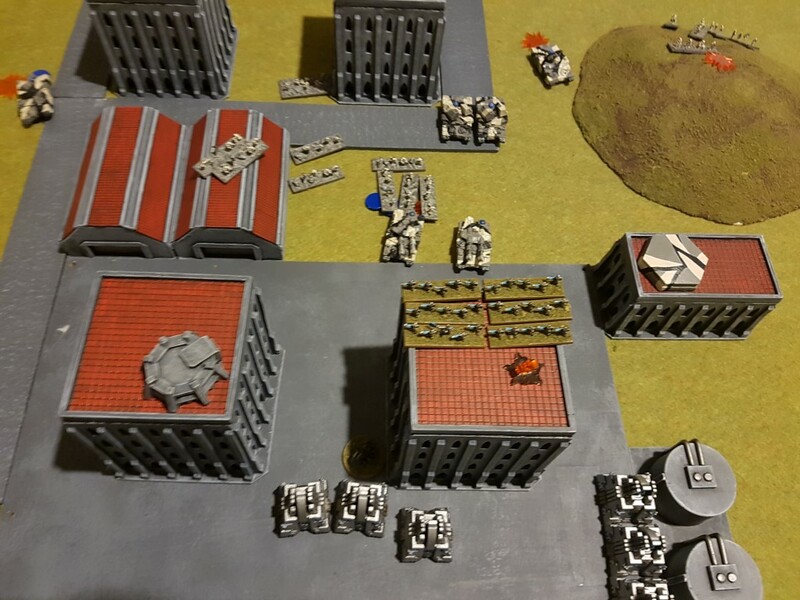 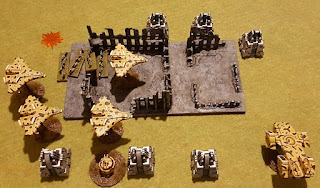 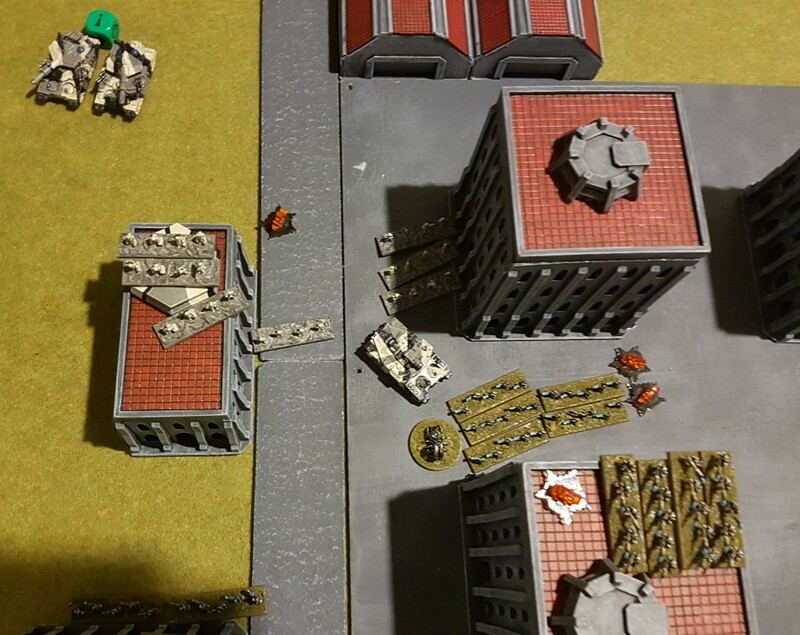 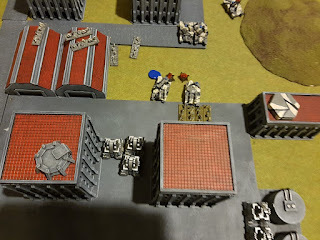 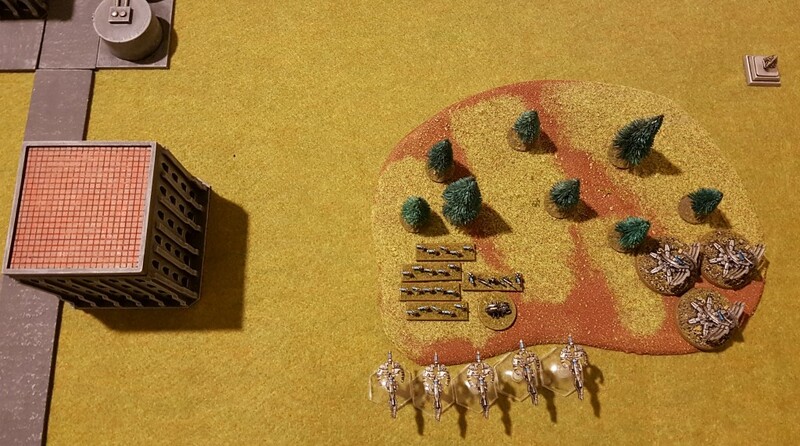 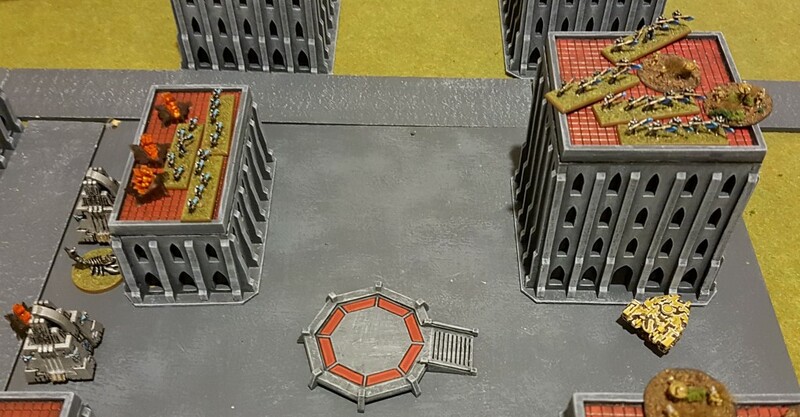 Necrons break another Ordinatus formation, but then a 6-1 result throws back a Necron Monolith firefight assault. 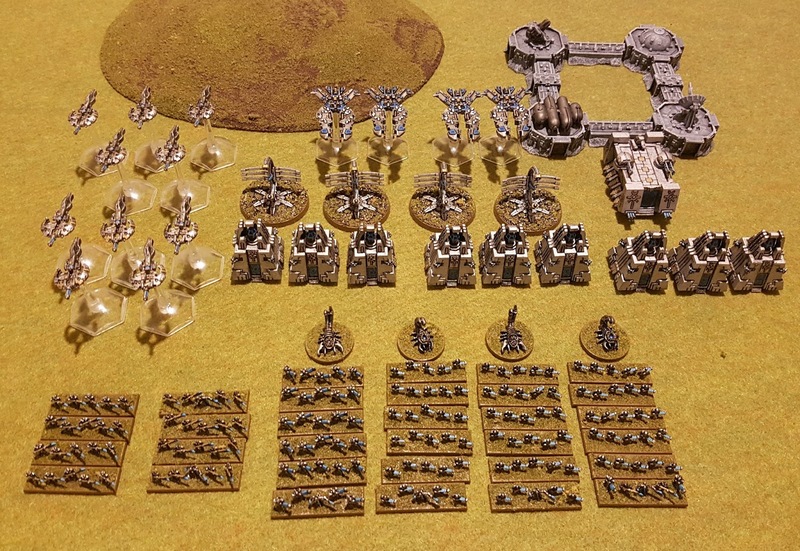 Rallying Necrons bring back many units to contest their Blitz. 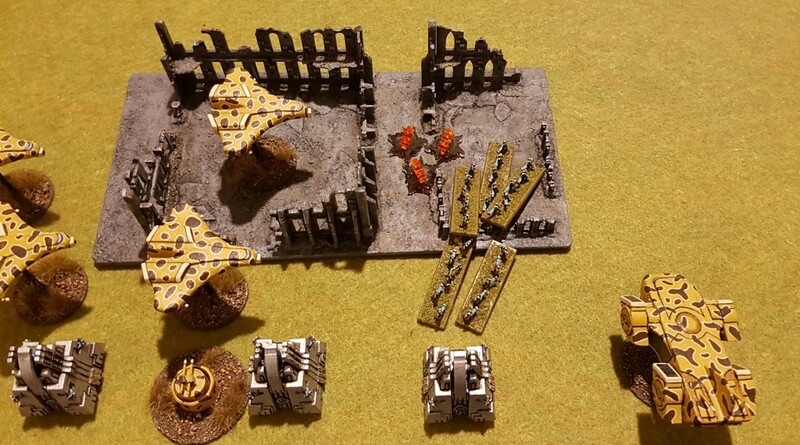 But weight of fire and blast markers means the reduced Necron formations are breaking and unable to hold ground. 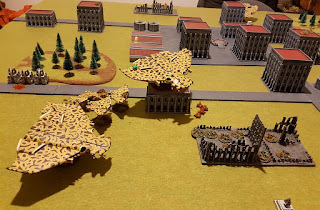 A lack of recovery of broken formations last turn hasn't helped either, and Skitarii manage to win with "Defend the Flag" and "They Shall Not Pass" victory conditions.